With a cataclysm of fire and ash, the earth began preparing a home for the Ancestral Pueblo people more than one million years before they arrived. The eruption of Valles Caldera in Northern New Mexico rained cinders over a 1,500 square mile area and created ash flows up to 1,000 feet thick. The ash eventually cooled into a soft rock, called tuff, suitable for carving into the cliff-side dwellings found at Bandelier National Park. 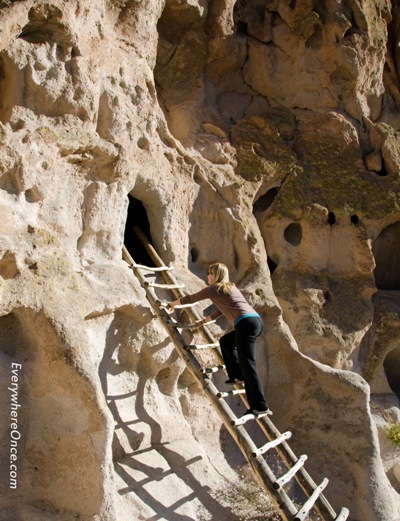 Using hand tools, the Ancestral Pueblo people enlarged natural holes in the rock to form “caveate” shelters, often accessed by ladders. In some instances, they also constructed apartment-like facades along the cliff wall. Inside, soot stains blacken the caveate ceilings. It is believed the soot helped to seal the crumbly volcanic tuff and prevented dirt from constantly raining down on inhabitants. 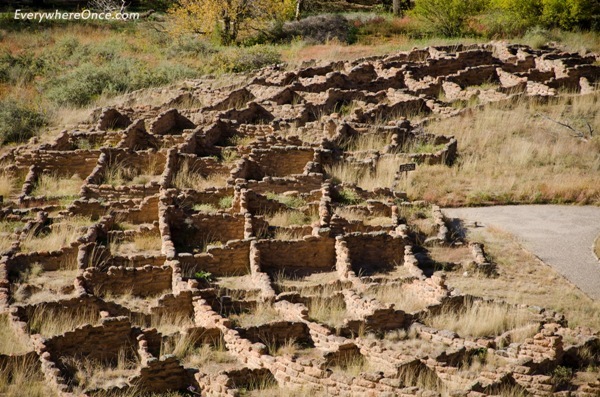 These canyon floor ruins may have been summer residences due to their closer proximity to crops and the Frijoles creek. In winter, the southern facing caveats dug into the cliff side absorbed plenty of sunshine and stayed about 13 degrees warmer than the canyon floor. We learned quickly on a rafting trip we took years ago through the Grand Canyon to set up camp as far as possible from the canyon wall – they radiated heat all night long. Good in the winter. Not so great when days are typically above 100 degrees. 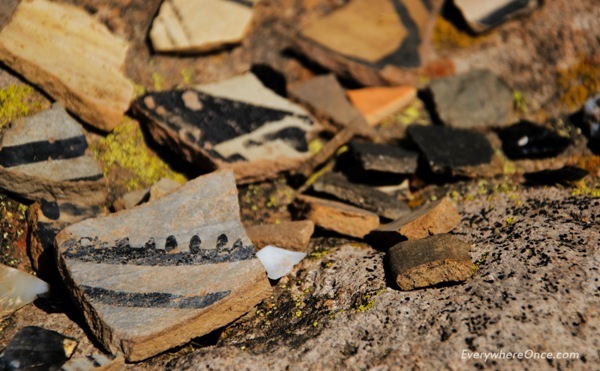 Ancient pottery shards surprisingly just left along the Tsankawi trail. We took our photograph and left the relics for the benefit of the next traveler, who will hopefully return the favor. 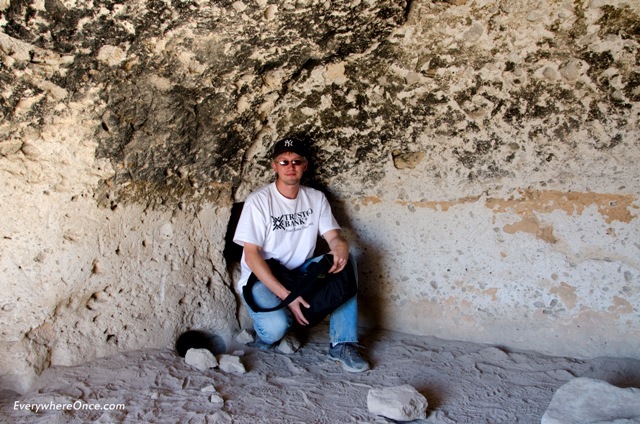 I think I actually like Bandelier better than Mesa Verde. We went in 1963, so I was pretty young, but the memory of climbing those ladders stuck with me. I think it is significantly less visited also, which makes for a higher quality visit. Thanks for sharing!! We haven’t been to Mesa Verde yet. I think we’ll probably hit that in the spring on our way North again. It always amazes me what nature can create and how people adapt to it. I’m also curious with the Pueblo. I don’t know much about them because they are never mentioned in history classes when I was still a student. There are places in Italy where houses were made from volcanic rock. There is is called Tufa. Yeah, I think it is the same stuff. It’s a soft material that was “easy” to dig with rudimentary tools. You can also make bricks from it so it made a good building material too. Stunning photos. 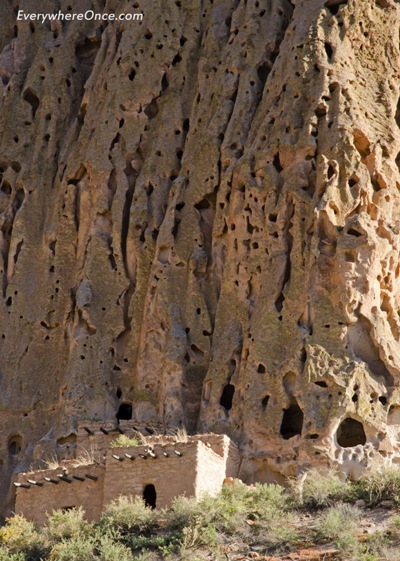 Love the details you provide, “The ash eventually cooled into a soft rock, called tuff, suitable for carving into the cliff-side dwellings found at Bandelier National Park.” I had no idea what caused that pock-mark look on the rocks. It also looks incredibly cool – the buildings and the ladders to climb up it. We found it surprisingly cool. It really was a very neat place.